I am the youngest of all my siblings. My only sorrow is that this sweet little flouncy skirt doesn’t fit me. Do you have a skirt that has a busted zipper, a tear or stain towards the top? Cut the bottom of the skirt off, 9 inches from the bottom. By using the bottom of the skirt, you don’t have to hem it or sew up the sides. Eliminates some work from your project. Then cut another piece that is 25 x 6.5 inches. Then sew this rectangle piece together along the short ends (6.5 inch side) to form a tube. Then hem the bottom by folding under a 1/4 inch and then another 1/4 inch. Then make a casing along the top by folding under a 1/4 inch and then 1 1/4 inch. (We’ll be using 1 inch wide elastic. If you’re using a different size, adjust this casing accordingly.) Make sure to leave an opening for the elastic to go through. Now you’ll make a basting stitch (the largest stitch length on your machine) a 1/4 inch from the top of your skirt section. Make 2 seams…….one along the front and one along the back. Leave long thread tails at each end. Then looking at your main skirt section, place pins at the sides and then fold in half and put pins at the half marks on both sides. You now have the top part of your skirt sectioned off into 4 equal sections. Then do the same with the waistband section along the bottom. Place 4 pins at each quarter. Then line up the side pins of the skirt with the side pins of the waistbands. Pin them together, allowing the skirt fabric to overlap the waistband 3/4 of an inch from the bottom. Do the same with the other pins. Now you’ll pull the top thread at one end and slide the fabric along until it is evenly gathered in this section. Repeat with all of the sections, making sure to add pins to secure it in place. Then cut out an appropriate length of 1 inch wide elastic. (Mine was 17 inches long.) Attach a safety pin to one end and thread it through your casing. Then overlap the two ends and sew a couple seams to secure the elastic closed. Then close off your casing and wow, you’re done. 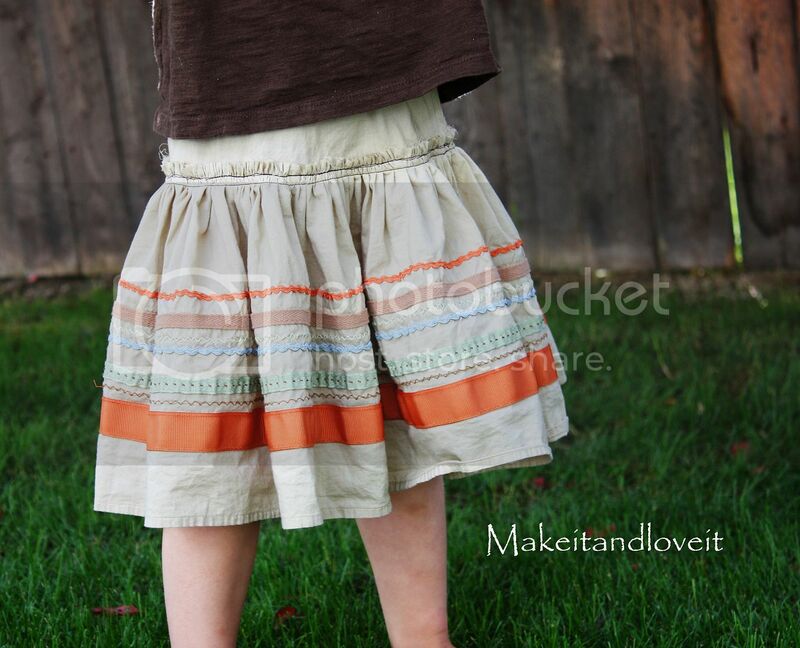 A really quick a easy, yet sassy little skirt for any little girl. Ta-Da. DARLING! You are amazing. :) i need little girls to sew for….hmmmmm. any extra clothes you make for fun is always appreciated so much by children that can not get much and parents always appreciate any help they can get for their kids.call the churches and schools they should know of families that could really use some help especially in this economy.And I promise you will be more thanked and appreciated then you can know. I love this idea – thank for sharing!!!! I love re-purposing! This is a great one to keep in my craft bank!! So cute! Great idea. Thanks so much! Adorable. Not sure I could get my son to wear it though…wish I had a little girl to sew for! I just love it!! I love your tutorials too! I can't wait till my baby girl is a little older so I can start making custy stuff for her! You are amazing! I love love love all your repurposing! That skirt is too cute. What a good idea. 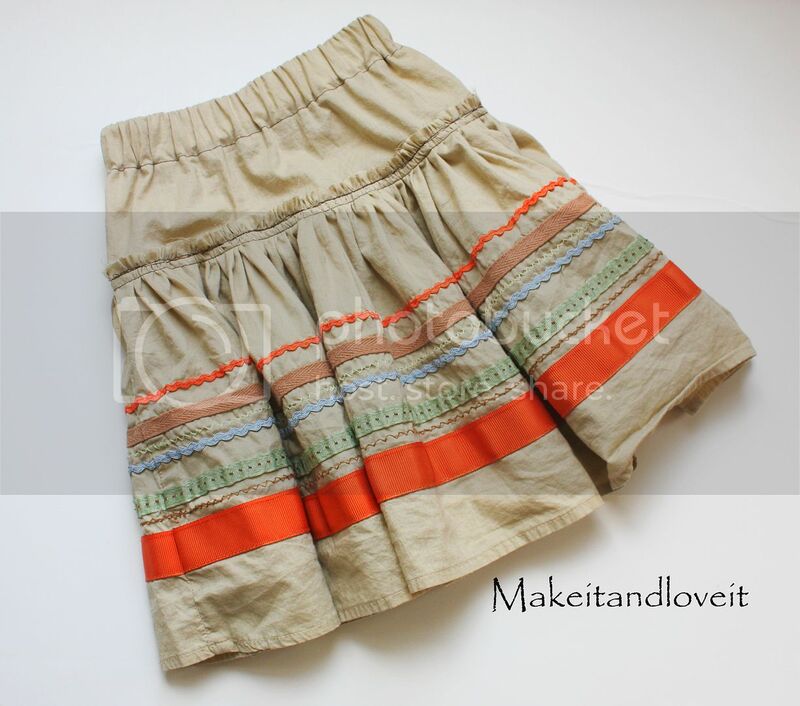 I almost want to go shopping at a thrift shop to find skirts I could repurpose for my girls! what a great idea!!! wow! the skirt is adorable! thank you for this tutorial. As soon as I saw this I knew exactly what skirt I wanted to repurpose! I have had a skirt in my closet that is just toooooooo long for me and I was able to shorten my skirt and make a matching one for my daughter! I even got a head scarf out of it! Thanks. I'll be posting my skirt on my blog soon. It looks great! I have a skirt I'd like to repurpose for one of my girls too. But it's not quite as cute to begin with. Ashley, You're so darn creative I just can't stand it! Love, love, love this idea! wow! I love to sew! I am just thrilled with your talents. I love them all! I too need girls to sew for. :) someday! thanks for sharing your talent! So cute! You have inspired me so much to make better use of the old clothes in our house! Thank you, thank you. I haven't commented until now – I know shame on me – but I have been blog stalking you for a while. Super cute. I am SO going to do this! Super darling!!! I love a skirt revamp!!! I have that exact skirt and the zipper is broken…you have made the crafty part of my brain crazy with possibilities…i love it! Wow, what a great tutorial! That is adorable!! so cute! I need to find a skirt and make one for my dd. i actually have that exact skirt from target a few years ago. i want this for myself!!!! Gorgeous – Love being able to refashion beautiful (but wrong size) clothing into something my littlies can wear. oh my goodness, i have that exact skirt! it’s sitting in my closet for a while. i have dreaded the idea of just throwing it away . i was waiting for an idea to come along for re purpose! time to get to cutting!